This bedroom set consists of a king size bed, two side tables, a dressing table and a closed cabinet. 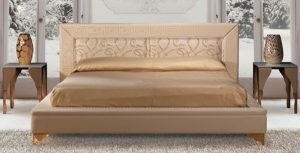 The wooden bed has a well-tucked leather headrest for proving a comfort to the person laying his/her head on it. The dressing table features a big mirror along with a chain of drawers ensuring more storage space. This bedroom set has a matte polish that creates a style statement in any bedroom.